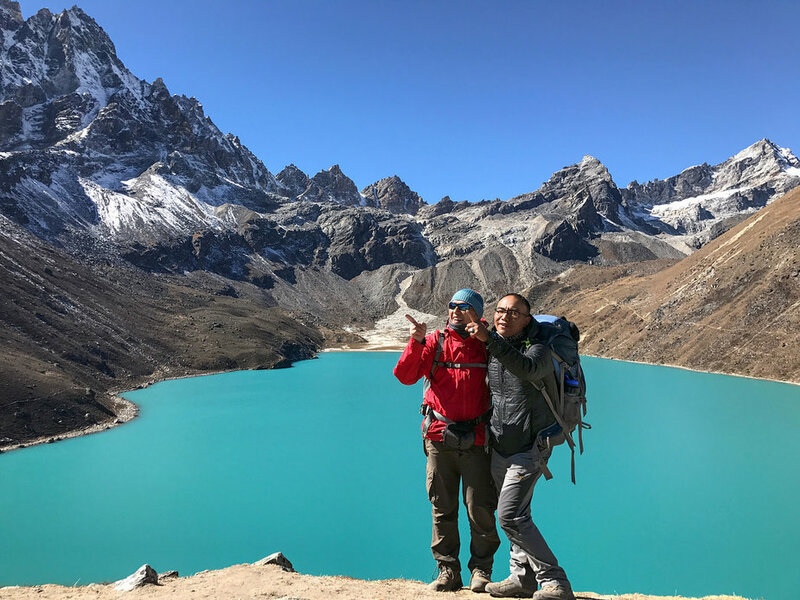 Gokyo Lake Trekking, where adventure leads you to picturesque areas of high Khumbu valley at scenic Gokyo with its simmering glacial lakes in the shade of world 6th highest Mt. Cho-Oyu (8,201 m) and Mt. 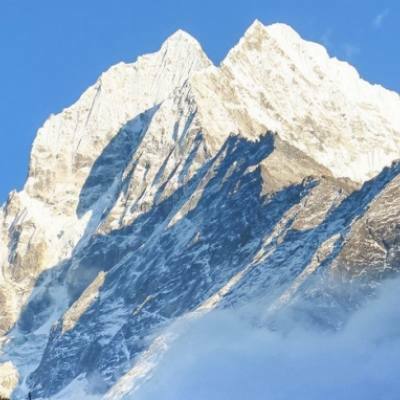 number one Everest (8,848 m) with array of peaks that surrounds this beautiful valley and lakes of Gokyo. 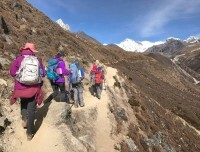 Fascinating walks with daily views of stunning Khumbu Himalaya which consist from high above 8,000 m to lower 7,000 m and 6,000 m range of peaks includes from Everest-Lhotse-Cho Oyu-Nuptse-Ama Dablam-Kangtenga-Kongde-Thamasarku and Kusum Khanguru including many smaller peaks. Walking into Sagarmatha National Park the highest as well listed in World Heritage Sites which makes the journey to Gokyo Lake Trekking more interesting within forest of blue pines-silver firs-rhododendron and magnolia trees which disappear as our route leads much higher into arid and barren beautiful country at Gokyo Lake areas. 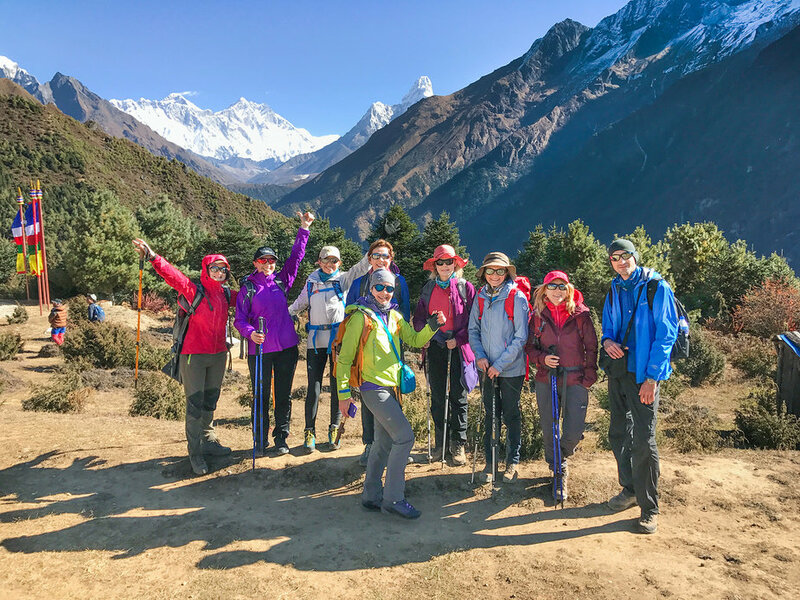 Truly a great adventure of moderate grade walks with touch of high altitude as our journey continues with rest days for acclimatization and side trips to amazing view points to catch magnificent panorama of Everest with other range of mountains. Starting with gradual pleasant walk from Lukla after a flight from Kathmandu and then heading higher past nice Sherpa villages Phakding-Monjo and at famed Namche Bazaar an interesting place for rest and excursion, and then our route leads away from main trail heading towards tranquil path with awesome views to reach at scenic and picturesque Gokyo Lake. 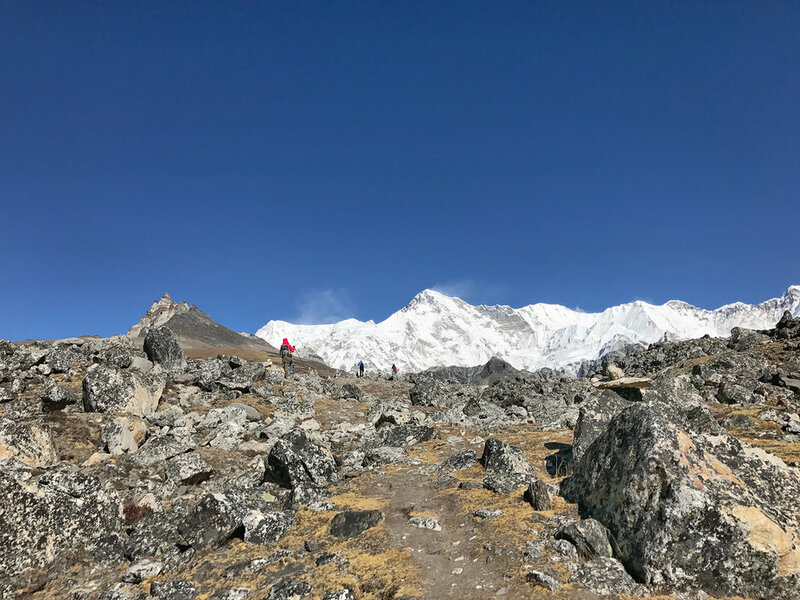 At Gokyo climb to the highest spot of the adventure on top Gokyo Ri at above 5,357 m offering super panorama of worlds four highest mountains from Everest-Lhotse-Cho Oyu with Makalu towards east with array of peaks. 1 Day 1: Arrival in Kathmandu and transfer to hotels.On reaching Kathmandu Tribhuwan International Airport where you will be warmly received by our guide and staff and then transfer you to your respective hotels in the hub of Kathmandu city. 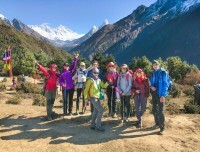 First check into your hotel rooms on getting refreshed from the flight and with Jet-Lag, then join with other members of Gokyo Lake trekking for group briefing, where our expert guides will inform regarding your stay in Nepal, hotels, trekking, local lodge and overland drives with do’s and don’ts information, evening welcome group dinner in authentic Nepalese restaurants with Folk cultural programs to entertain you during your meals. 2 Day 2: In Kathmandu with sightseeing tour around world heritage sites.Morning after breakfast leave the hotel for exciting guided sightseeing around Kathmandu where our city guide will lead you to places of interest, Kathmandu a metropolitan city still retains its ancient heritage and varied ancient culture where you will visit world heritage sites around Kathmandu for half day or full day. After an interesting and wonderful tour of ancient historical and religious sites around Kathmandu, with afternoon free preparation for next day flight to Lukla for Gokyo Lake trek. 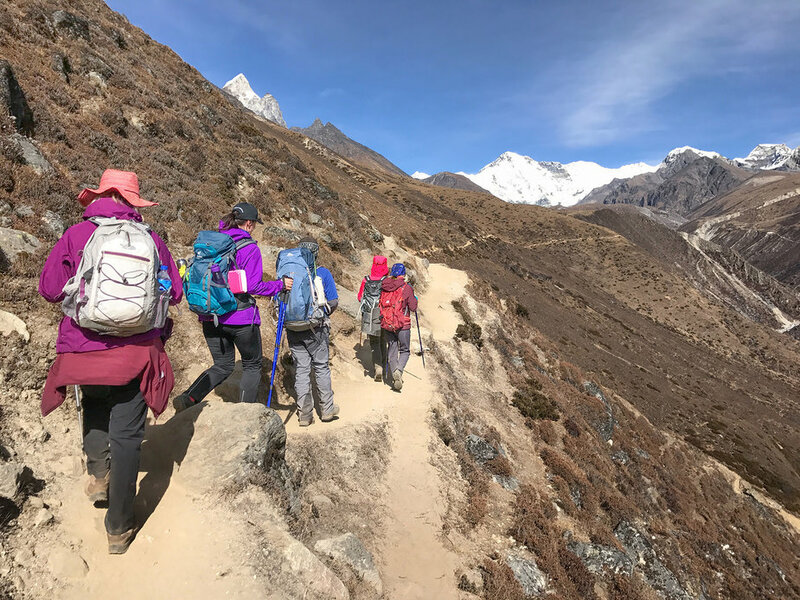 6 Day 6: Trek to Khumjung 3,730 m via Khunde 3,880 m - 04 hrs walks.A short day of few hours as morning walks leads to a climb for an hour to Syangboche a place with old small airstrip, often used for STOL aircraft and Helicopters, facing views of Everest and majestic Ama Dablam, from here taking a route first visiting Khunde village, located on scenic glacial valley beneath sacred peak Khumbi-la (holy and patron god of Khumbu Sherpa). 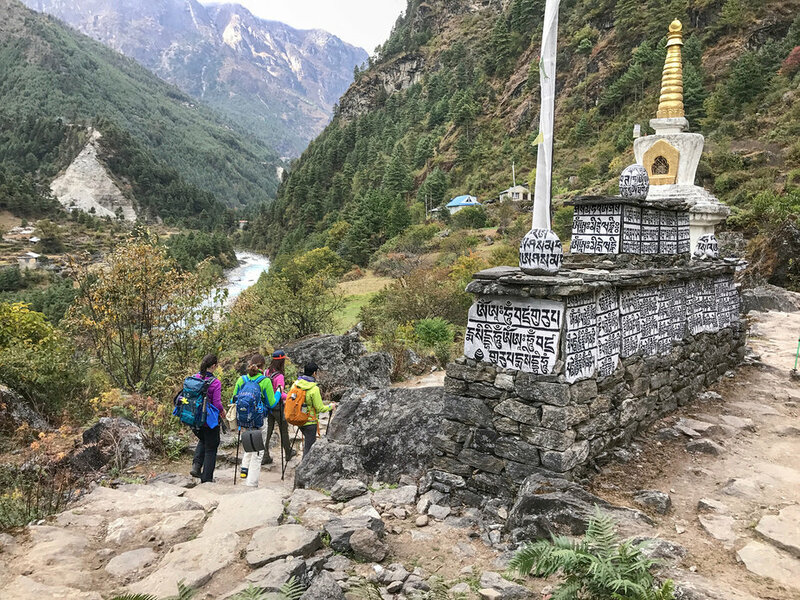 Here at Khunde visit its only hospital built by late Edmund Hillary Trust & Foundation and a short walk downhill to its adjoining village at Khumjung for lunch and overnight stop. 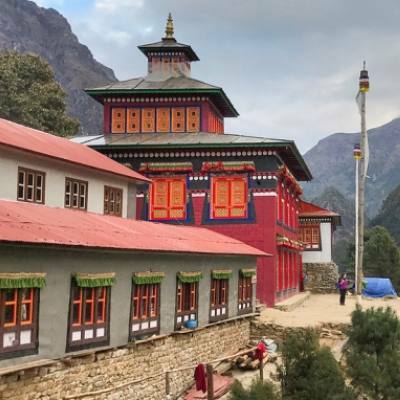 Khumjung one of the largest Sherpa villages around Khumbu area, with time to visit its old Monastery, the only place that treasures a scalp believed to be of Yeti kept in a glass box where you can witness with some donations. 7 Day 7: Trek to Dole 4,110 m - 06 hrs.From Khumjung walk leads on gradual scenic path with uphill to reach at Mong Hill with few houses serving as Tea-House and Lodge with fantastic views of peaks, from here downhill to Phortse Tenga near Dudh Kosi within forested area. With possible lunch stop, afternoon walk leads to a climb into rhododendron, pines, fir forest with grand views of snowcapped peaks. 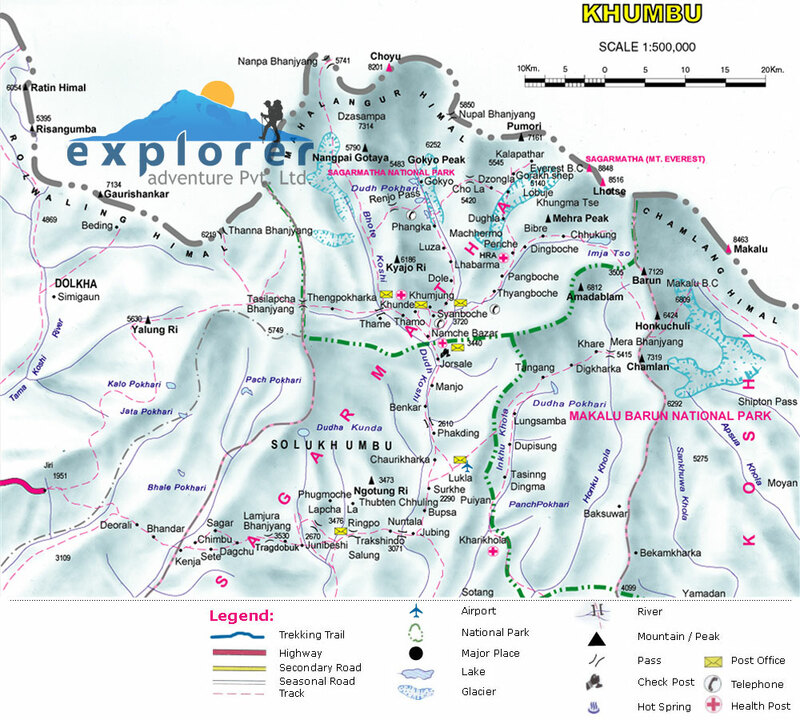 After few hours climb reaching at Dole at 4,110 m high a moderate size settlement with good lodges to stay. 8 Day 8: Trek to Machherma 4,470m - 04 hrs.After Dole, walk on high trail for an hour to Lhabarma Kharka at 4,325 m and Luza at 4,390m; then skirting around a ridge with views of Machherma, situated below on a small valley, walk downhill to Machherma for lunch and overnight stop. Here after lunch rest of the afternoon free for acclimatization and short hike with views of Mt. Cho Oyo 8,210m and other mountains flanking above Ngozumba Glacier. 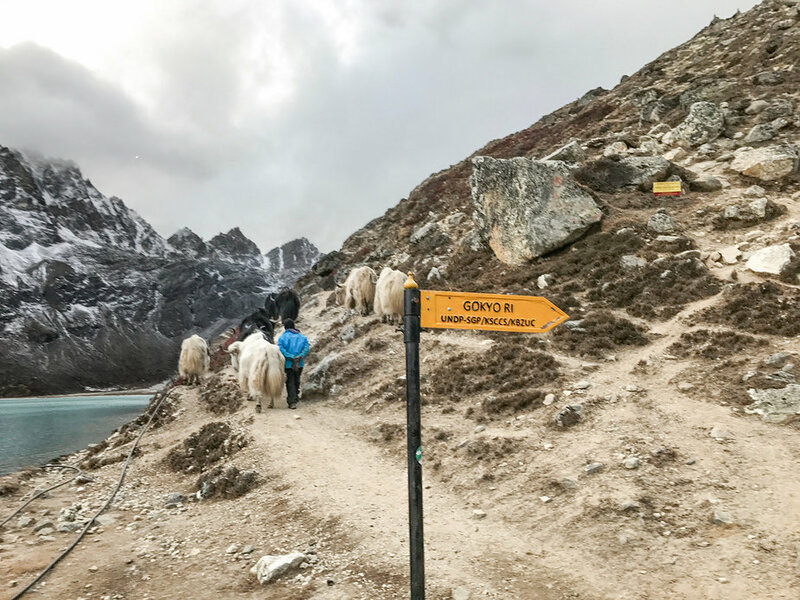 9 Day 9: Trek to Gokyo 4,800m -04 hrs.Morning walk leads to Gokyo Lake following a scenic trail to Pangka 4,545m, then climb on rocky path into ablation valley passing first lake and then second lakes, to reach a third lake called Dudh Pokhari or Gokyo Lake. 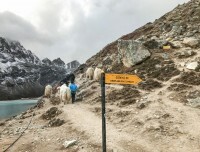 This beautiful area within Gokyo at 4,790 meters high, after lunch short walk around lake with views of Mt. Cho Oyo world’s 06th highest and Gyachung Kang that reflects on emerald Gokyo Lake. 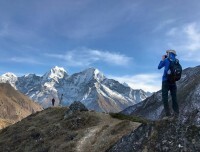 10 Day 10: Hike to Gokyo-Ri 5,357 m free afternoon walk to Na 4,630 m or further - 04 hrs.Morning a climb of few hours to reach our highest point of the adventure on top scenic Gokyo Ri at 5,357 m high offering tremendous panorama from Mt. Cho-Oyu, Mt. 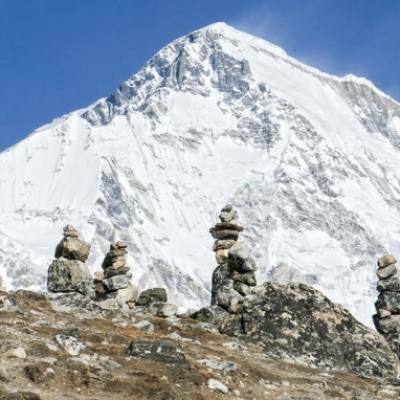 Everest, Lhotse and of Mt. 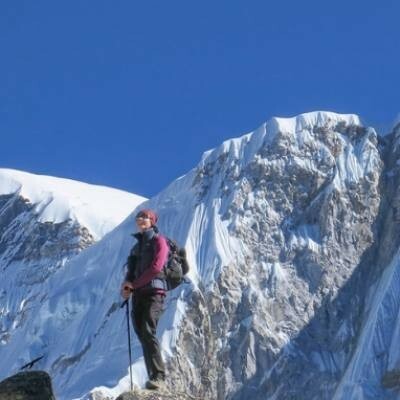 Makalu covering four world highest mountains at one glance with series of smaller peaks. Enjoying the views head down to Gokyo for lunch with easy short afternoon walks to Na a small settlement located beneath massive Ngozumba Glacier. 11 Day 11: Trek to Phortse village 3,860 m - 04 hrs.After a wonderful and exciting time around Gokyo valley and the lake, morning an easier walk downhill to reach at a sleepy and quaint Phortse village, where few trekkers seldom pass this way an interesting Sherpa village away from main stream trekking trails. At Phortse with ample time for short walks around the village and viewpoints which is above Dudh Kosi River. 12 Day 12: Trek to Thyangboche Monastery 3,867 m - 05 hrs.Enjoying pleasant time at Phortse, morning walk leads to scenic and gradual walks overlooking Everest and other giant peaks, as our route leads to high Pangboche village and its old monastery, here with time to visit the monastery and then downhill to Imjatse river. 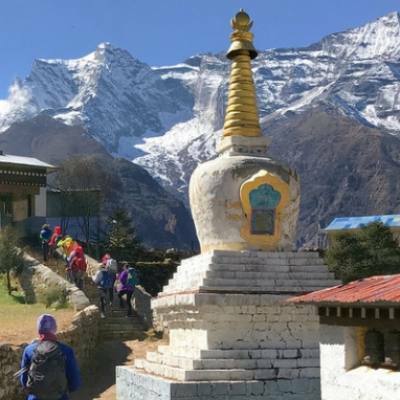 From here uphill into enchanting alpine forest to reach a beautiful surrounding at Thyangboche Monastery offering grand panorama of mountains with Everest and Amadablam at close distance, here with time for tour into monastery and witness monks and priest on prayer. Thyangboche also holds colorful festival ‘Mani-Rimdu’ monks with mask dancing wading evil spirits which falls in the month of October as per Buddhist lunar calendar. 15 Day 15: Fly to Kathmandu and then transfer to your hotels.Morning transfer to Lukla Tenzing and Hillary airport for sweeping short flight to Kathmandu facing scenic views of mountains, green scenery of hills and farm fields with nice villages and towns as flight lands at Kathmandu airport and then back to your hotel, with free afternoon to relax of great memorable time around Gokyo Lake Trekking. 17 Day 17: Depart for international flight home ward bound or to respective countries.Your last memorable day in Nepal after a wonderful experience on Gokyo Lake trekking with great service of Explorer Adventure, and as per your international flight then transfer to Kathmandu international airport for homeward bound or to your respective destinations. Highest elevation gain: 5,357m high on top Gokyo -Ri.